One of my favorite breakfast baked all into a casserole. 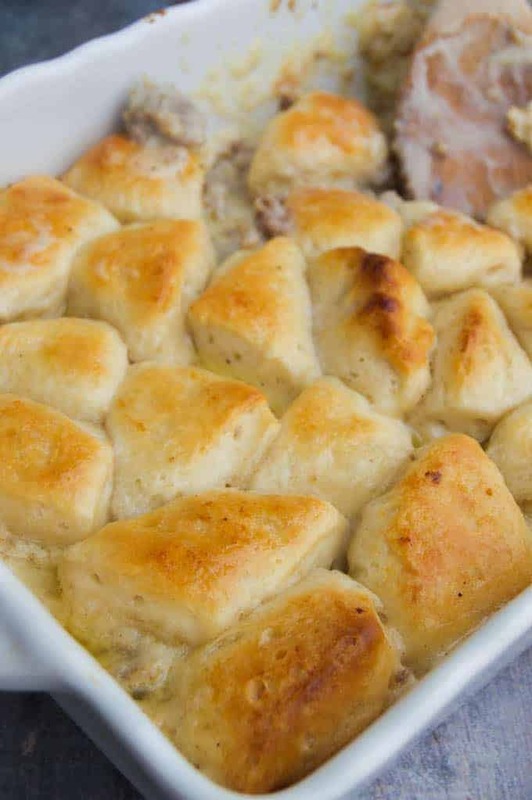 This Biscuits and Gravy Casserole is made with a amazing sausage gravy bottom layer and topped with biscuit pieces and baked. I can honestly say this is my very favorite breakfast casserole. I have always loved biscuits and gravy, it’s been a favorite for as long as I can remember. Every time I make it I think of my Granny. I remember spending the night at her house on the weekends and she always woke up early and had an amazing breakfast waiting for me. She let me sleep in as long as I wanted and watch TV as late as I wanted, and then waking up to the best homemade sausage gravy. You want to start by cooking your ground breakfast sausage. I used turkey sausage, but any ground sausage you have will work. Once your sausage is cooked you want to add flour, garlic powder, salt, and pepper right to the skillet. Cook together until your flour mixture is competently adsorbed, this make your gravy nice and think. Time to add your milk and simmer until your gravy has thickened. Once it has a good thickness add it to the bottom of a casserole dish. 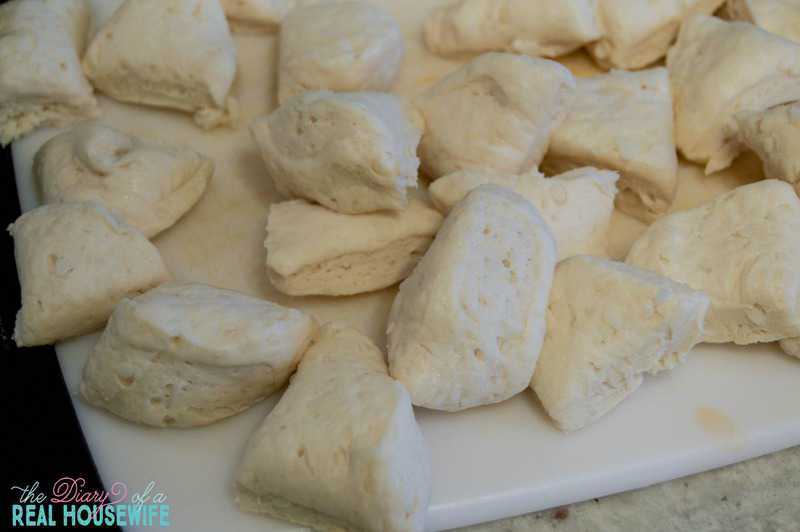 Preheat your oven and then cut your biscuits into 4 pieces. Add all the biscuits to the top of your casserole dish and bake. Once baked brush the tops of your biscuits with melted butter. In a large skillet brown ground sausage until cooked through. In a mixing bowl mix together flour, garlic powder, salt, and pepper. Add to skillet with ground sausage and cook until absorbed. Add milk and stir. Bring to a simmer, cook, and frequently stir on low around 5 minutes while gravy starts to thicken. Pour gravy into a casserole dish. Preheat oven to 400 degrees F. Slice canned biscuits into 4 pieces and add to the top of the gravy. Bake for 15-20 minutes until your biscuits are golden brown. Last brush the top of the biscuits with melted butter. Serve and enjoy this yummy breakfast! Any specific kind of biscuit dough? What size casserole dish? Hi Mary! I just used a can biscuit dough. I have made it several times with several times and they all work well. I like the big grands because of how fluffy they are!I used am 9×9 pan =. Hope you enjoy the recipe! One of our favorite breakfast recipes. Thanks you!! This breakfast recipe was a hit with the family!! A recipe that we loved!! Thanks so much for sharing! Yes this can be frozen. When I freeze it I usually make the sausage gravy portion and freeze that. You can place it in the fridge the night before baking then just top it with the biscuits before you place it in the oven. Hope that helps Michelle! I am thinking of making this for my sons football team, how many does this original recipe serve? Hi Debbie! This recipe can serve 5 but with football players maybe 3-4 😉 I have three growing boys and now how much they can eat! I hope you and the team enjoy the recipe. I have a 13×9 pan will that work? Yes that will work! Hope you enjoy the recipe! Can this be made the night before and then put in the oven to bake the next day? Hi Meridith! I would go ahead and make the gravy and just add the biscuit the next day before baking. Adding them before could get them soggy. Can you use frozen biscuits? Hi Jenn, I have not used frozen biscuits for this recipe but I think you could but it might need more time to bake. I would following the cooking instructions on the frozen biscuits. If I double this do you suggest using a 9×13 pan? Also what cooking time would you suggest if doubled? Hi Taylor, yes that size pan should work to double the recipe. The cooking time should stay the same since the meat is already cooked.